The US is all set to reinstate sanctions on Iran that removed under the 2015 nuclear deal on November 5. 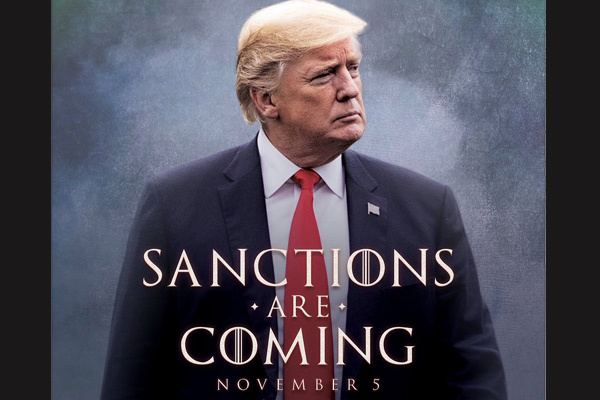 "Sanctions are coming," tweeted US President Donal Trump. It will be the "toughest sanctions regime ever imposed on Iran" and will target Iran's energy, shipping and banking sectors, the White House said. However, eight oil importing states will not be penalised by the US for continuing to import Iranian oil. They include India, Italy, Japan, South Korea and Turkey, A BBC report said. EU states which backed the deal have said they will protect EU firms doing "legitimate" business with Iran, it added. US President Donald Trump withdrew from the deal in May, describing it as "defective at its core". The US has been gradually re-imposing sanctions since it unilaterally withdrew from the agreement, but analysts say this move is the most important because it targets the core sectors of Iran's economy.